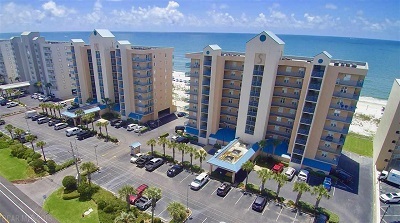 Gulf Shores Alabama beachfront condominium home for sale at Surfside Shores. This tastefully decorated 2BR/2BA unit offers amazing gulf front views from the living room and master, both with access to the spacious balcony. The coffee table, end tables, and accent table in the living room are brand new. The kitchen has granite counters, large in-set sink, and tile throughout the unit. Each bedroom has a private bathroom. This wonderful complex offers a beach-side pool and kiddie pool w/ spacious pool deck, along with a grilling area and landscaped courtyard. Don’t miss out on the opportunity to own this little piece of paradise!! It would make a great investment or a perfect beach getaway!! Visit: Surfside Shores Condos For Sale in Gulf Shores AL.